It is hard to imagine a more idyllic site for a school than the land which was acquired for the building of Eversley at the beginning of the twentieth century. No houses had been built opposite the school site in Coolinge Lane which was still very much a country lane. On the same side as the school were Coolinge House with its Georgian facade and the white walled Coolinge Farm house while to the west the school looked over the arable and lush pasture land of Coolinge farm. To the south were the playing fields of Praetoria House and Pelham House School, and to complete the vista, the English Channel was beyond. Miss Kate Nancy White, the Head of Eversley School which in the 1890’s occupied three buildings in Earls Avenue and was advertised as a private school for “young ladies”, moved her pupils into the imposing, spacious boarding school, designed by William Newton Dunn and Son, 1905/6. This exclusive girls’ school remained here for the next thirty years. Since then, the building has had several changes of use. It was requisitioned by the military in the Second World War, and afterwards acquired by KCC who used it firstly as an emergency Teacher Training College, then as the Girls’ Technical School. Following adaptation of the building, it was opened in 1967 by the Rt. Hon. Sir Edward Boyle as a residential college providing in service courses mainly for teachers. At the end of the century, KCC sold the building which became a school for Japanese students. The Edwardian building has now been converted into luxury apartments and while the contractors were working on the conversion in 2014, several interesting finds were made. The foundation stone of the Chapel of the “Young Ladies’ School” was unearthed and in a rectangular recess in the side, a champagne bottle wrapped in newspaper and hessian was discovered. Within the bottle were the remains of a document which had disintegrated into two larger pieces of paper along with several smaller pieces, all in a much degraded, crumbling, powdery state but obviously containing a list of signatures. It was impossible to handle these pieces of paper without causing further damage. The developer of Eversley Park, much interested in the history of the building, arranged for the repair of the foundation stone and wished to find out more about the pieces of paper in the bottle. The help of Deborah Colam, a Conservator who does much work for English Heritage and who will be our speaker at the Local History Society’s meeting on 4 May 2016, was sought. This should be a very interesting meeting giving us information on how to look after archives, photographs and artefacts which are so essential for a local historian.The process undertaken by Deborah took two months and included treating the pieces of parchment by eradicating the mould, cleaning, stabilizing, fitting the pieces together and mounting them in such a way that the document could be handled so that many of the signatures could be read. The signatures on the four edges are still very difficult to read where damp has caused much damage, and the ink has faded. However, the central section has been recovered. Once the parchment could be deciphered, the first question to resolve was the dating of the document in the bottle. The foundation stone recorded that the stone was laid by the Right Reverend, the Lord Bishop of Dover June 13th 1908, and beneath was a quotation from the Book of Proverbs, ‘the fear of the Lord is the beginning of knowledge.’ However, the champagne bottle was wrapped in newspaper dated August 3rd 1923, which was sealed with wax inside a hessian sack. Had the original document in the bottle been removed and another inserted sometime after 1923? In fact, once the names could be read, they were compared with the 1911 census for Eversley and it was found that several of the names on the document were also on the 1911 census. Although it was possible that some of the staff in 1911 would still have been there in 1923, the pupils recorded on the 1911 census were very unlikely indeed to have still been at school twelve years later. The pupils’ names duplicated on the document and the 1911 census were: Gladys Godson, Eileen Godson, (daughters of a solicitor at Heckington in Lincolnshire), Vera Margaret Duff Porter, Doris E. Morton, Mary F Lucas, Phyllis Layton, Doris Garrard, Muriel Sharp and Dora Riddoch. Dora, who was fourteen at the time of the Chapel consecration, lived at Fonthill, Reigate, where her father’s occupation was described as Ship Broker and agent. Dora is to be found on the electoral rolls of Reigate from 1927 until her death aged 61. Another signature on the document is that of Hilda Price, who although not on the 1911 census is on the 1901 census aged eight years. There were several of the staff – maids and teachers on both lists. Finally, the last two readable names are F Evelyn Gardiner and his wife Daisy. The Reverend F Evelyn Gardiner was the Vicar of Holy Trinity Church, Folkestone in 1908 but had retired by 1923. It would be an enormous task to research the family history of all the names on this list –nearly one hundred. However, what is clear is that they came from all parts of Britain. Daughters were obviously sent quite a distance from home to boarding school. Of the more unusual names on the document, the early life of Lilian Aimée Stavert was researched. She was born in 1892 and so was sixteen at the time of the consecration of the Chapel. Her father had farmed four hundred and ten acres in Helsington, Westmorland but had died three years before the consecration of the Chapel. By 1911, her widowed mother “of independent means” was living near Kendal with three of her children including Lilian, aged nineteen, who had left school. Her mother died later in the year on 9 June 1911, and aged twenty two, Lilian was married in Kendal in 1914. Her husband was a manager of an explosives factory and shortly after the outbreak of war he was gazetted a Second Lieutenant in the King’s Liverpool Regiment. He was killed in action in 1917 and Lilian was widowed aged twenty five. Perhaps it was as well that the girls who signed the document in 1908, presumably with high hopes, had little thought that the country would be at war within six years, and what changes that would bring to their lives. Of the staff at Eversley, the signature of Kate Nancy White, the Head, can just about be deciphered under that of the Bishop of Dover. She had been Head of the school since it had been located in Earls Avenue in the 1890’s and had also founded Eversley in Horn Street, a home for convalescent children which the girls at Eversley School in Coolinge Lane supported. Ethel Rose White, her sister, and Edith Fergusson are both listed as teachers at the school on the 1901 and 1911 censuses and also signed the document. Other signatures to be found are Annie Bowles, Kate Butterworth, Mary Bricknell, Emily Andrews and Minnie Peerless. Annie was the Housekeeper and the others all housemaids at Eversley. The marriage of Mary Bricknell to Mr A.V. Marsh is recorded in the local paper in 1912, and among the wedding gifts recorded are those given to the couple by the Head (bedroom suite), the Head’s sister (toilet set), the Head’s friend in India (cashmere cushions), the pupils (Crown China tea service) and the maids (a dinner service). 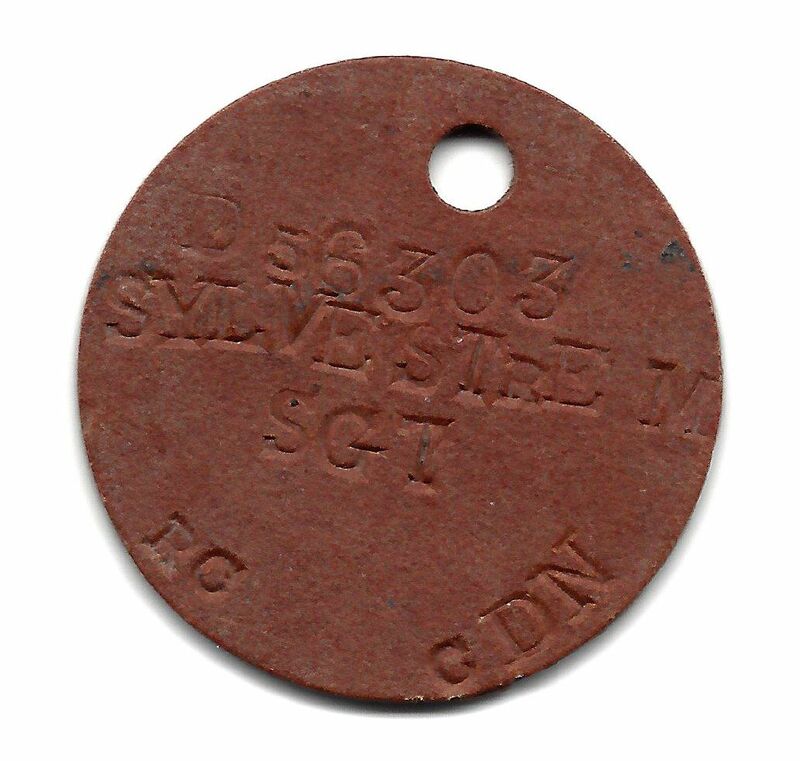 Additional finds at Eversley included three military identity discs, only one of which was readable. It belonged to a Canadian soldier of the Second World War. He was Sergeant M. Sylvestre, whose religion was given as Roman Catholic and fortunately as he is not in the list of Canadian casualties must have survived the War. The Canadians were active in Folkestone in the period before the Normandy landings erecting decoys to suggest to the Germans that the landings would be in the Pas de Calais area and would be spear headed from this part of Kent. It would appear that Eversley may have played some part in this. The recent finds have encouraged me to look further at the history of Eversley School and its first Headmistress, Kate Nancy White. I hope this will be the subject of a future Local History newsletter. Website by Red Dragon I.T.